Roughly 165 million years ago during the mid-Jurassic, Madagascar was an alien place. The famously large island has yet to fully cleave itself tectonically from India and Africa, still crammed together with the rest of the southern supercontinent of Gondwana. Primates have yet to evolve, and flowers aren’t even a thing yet. This Madagascar is instead alive with a spectacular diversity of dinosaurs and reptiles, racing along the dirt and soaring above the forests. But everything that slinks, bounds, and lumbers across this sun-baked, proto-Madagascan theatre is united in unshakeable wariness over the region’s most feared apex predator: Razanandrongobe sakalavae, an enormous, land-striding relative of crocodiles with a nightmare where its face ought to go. 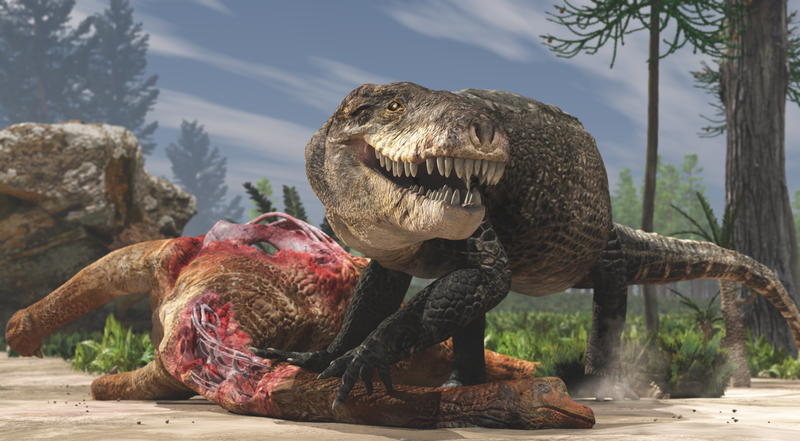 The fragmented fossilised remains of the horror-croc (nicknamed ‘Razana’, as in ‘Razana, Eater of Worlds’) have been described in a new paper in the journal PeerJ by a team of Italian and French palaeontologists. The species was first documented in the literature more than a decade ago, but due to limitations of the fossils, its specific classification was unknown. Up until now, it wasn’t clear if Razana was a massive, meat-eating theropod dinosaur, or some other kind of reptile. New fossils of the jaws and teeth, collected from the same region of northwestern Madagascar where the first fossils were found, reveal that Razanandrongobe sakalavae—the “giant lizard ancestor from Sakalava region”—was actually a relative of today’s crocodiles and alligators. Reconstruction of the jaws of Razanandrongobe sakalavae, including the original left dentary, right premaxilla (courtesy of the Natural History Museum of Toulouse ), and their counterlateral copies (in grey), printed in 3-D from CT data by FabLab Milan, and then mounted at the Natural History Museum of Milan. Credit: Giovanni Bindellini. Considering Razana had a grill so full of flesh-rending terror it’d make a T.Rex blush, it’s perhaps a little surprising the mean mug presented by the fossils didn’t belong to a predatory dinosaur. But Razana comes from a time when the crocodile family line was crowded, and full of creatures that weren’t content to wait poolside for the delivery of their prey. Razana was a ‘notosuchian’, a group of crocodilians that differed from their close, still-living cousins in a few very important ways. For one, Razana and other notosuchians were specialised for terrestrial life. Their legs were positioned straight and erect under their bodies, allowing them to gallop and sprint after prey in a decidedly athletic, uncrocodile-like manner. Notosuchians like Razana also had elevated skulls, making them look more Velociraptor and less pancake-headed swamp monster. Notosuchians were fierce predators that ranged all over Gondwana during the last half of the Mesozoic Era, but the new findings demonstrate that none of these souped-up crocs were quite as formidable as the monster from Madagascar. Razanandrongobe was huge, perhaps larger than any other known notosuchian. While it is hard to determine the exact size of an animal based on incomplete remains, the recovered portions of Razana’s head paint a picture of a carnivore that must have been a horrifying addition to ancient Madagascar’s fauna, an assemblage that included top predators like lithe, knotty-headed abelisaurs and razor-toothed ceratosaurs the size of pickup trucks. Razanandrongobe had a head as big as a washing machine, which evolution had outfitted with a battery of serrated, banana-sized teeth. These chompers were resilient and rugged enough, the researchers contend, that ol’ Razana might have been able to pulverise and gobble down bone and tendon along with its prey’s fleshy bits. This fearsome machinery, once attached to the standard, track-and-field star chassis of a notosuchian, likely made Razana the biggest and baddest predator of its ecosystem. Paleoartistic restoration [CDS1] of Razanandrongobe sakalavae scavenging on a sauropod carcass in the Middle Jurassic of Madagascar. Unlike extant crocodilians, this terrestrial predator had a deep skull and walked on erect limbs. Credit: Fabio Manucci. “‘Razana’ could outcompete even theropod dinosaurs, at the top of the food chain”, said Cristiano Dal Sasso, a palaeontologist at the Natural History Museum of Milan and first author on the new paper, in a press release. A non-dinosaur hunting and eating dinosaurs doesn’t fit well into the traditional idea that dinos reigned over the entirety of Earth’s terrestrial ecology for 135 million years. But, as science is rapidly finding out, the reality of the relationships between animal groups during this time period was a bit more complicated than one-party rule. While dinosaurs were especially prominent and diverse in the Jurassic and Cretaceous Periods, there was still plenty of mobility within the food web for the second string players. Razanandrongobe is a single, jarring example of the rejection of a dinosaurian regime, one that has company in scores of other ancient crocodilians and kin that gave dinos a run for their money. Sebecosuchians (close relatives of notosuchians) like Baurusuchus preyed upon smaller dinos in the late Cretaceous of Brazil, patrolling the landscape like armoured dire wolves. These terrestrial crocodilian cousins did so well for themselves that some survived in South America millions of years after the extinction of the dinosaurs. The “SuperCroc” of Africa, Sarcosuchus, was the size of a school bus and killed and ate dinosaurs. 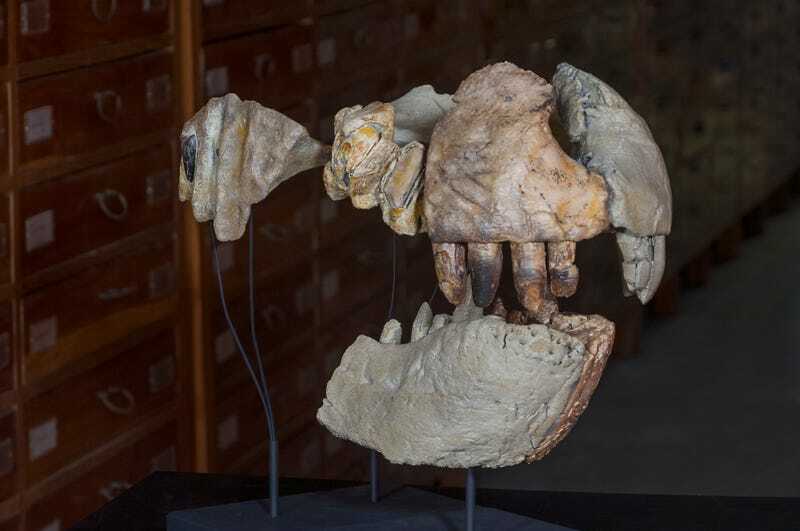 Even mammals, the supposed underdogs of the Mesozoic, occasionally had their day in the sun: Repenomamus, something of a 130 million year old murderous wombat, was discovered with the remains of a baby dinosaur fossilised in its belly. Beelzebufo, the largest known frog species ever, lived in Madagascar some time after Razana did; it was as big as a beachball, carnivorous, and almost certainly ate baby dinosaurs. “Razana” fits perfectly into an emerging view of the Age of Dinosaurs where the food chain wasn’t so one-sided. Jake Buehler is a science writer based in the Seattle area with a fanatical obsession with biology’s weirdest and under-acknowledged stories. Do Dogs Know They're Good Boys?